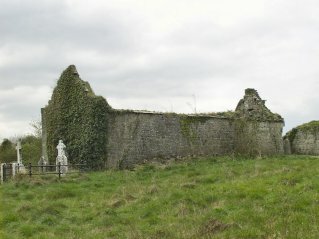 Extensive church ruins remain in Cappagh graveyard. All four walls of the ruin are standing, and the window frames are intact. Locals believe that this ruin may have once been an abbey. 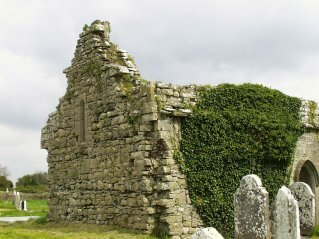 It is possible that this is ruin of Kilmacluana church, although it is more likely to have been a parish church. 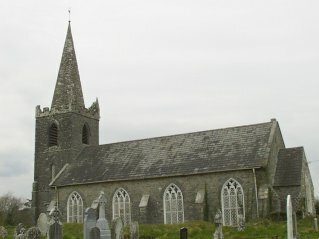 According to Westropp, Kilmacluana church was a small plain Gothic building, first recorded in 1201. It was destroyed by war in 1302, and in 1541, the Knight of Glin granted it to the friars of Askeaton. It contains a large east window with two pointed lights and a round headed splay. The doorway is in the south wall of the church. In his book "Cappagh - A Sense of History", Frank Whelan said that this was the oldest church in Cappagh. Nantenan church was located in Ardgoul townland. This Church of Ireland church was built on the site of the old medieval church. It was in use until 20 years ago. According to Westropp there was a church here in 1500. This church dates from the early 19th century. A mass house was used in the parish during penal times. 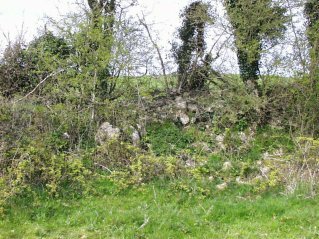 However, almost nothing remains of this now; the one remaining wall is virtually indistinguishable from the boundary wall of the field. It is covered by ivy and briars.